Are you ready to make the SILLIEST not-so-spooky Halloween treats? These vampire donuts come together in about 30 seconds. So easy and fun! An oldie, but goodie, re-posted from 2013! These vampire donuts just make me laugh. We made a special trip to Krispy Kreme last year just do get a dozen glazed donuts to make them for the kids for a fun and super sugary breakfast and they thought they were hilarious! So it’s now a Halloween tradition. And as an added bonus, they got a fun little toy to play with afterwards. We now have 4 sets of slobbery vampire fangs hanging around the house. The eyes are mini chocolate chips, but I’ve seen these little guys all over the web using m&ms, frosting, or any number of small items! Just use what you have in your cupboard. How fun would these be for a class party or Halloween party at home? We’ve made these a few times now and they are always such a hit! I do have a tip though, if you are using Krispy Kreme donuts, they are best when used the day they are made. Otherwise the glaze will crack when you add the fangs. If you are using day old donuts, just warm them up for 6-8 seconds to soften the glaze and they should work just fine! The fangs were leftovers from when we made these hilarious little vampire pumpkins we made a couple of years ago! A darling Halloween tic tac toe game, perfect for a classroom or kids costume party! It comes together easily using washi tape and craft paint. Store the pieces in a drawstring bag in between uses. If cake pops intimidate you, don’t fret! Rice Krispies pops are SO much quicker and easier and you can customize them a million ways. These mummy pops take about 10 minutes to make start to finish and are perfect for packaging up in Halloween treat bags! Here are even more fun Halloween treat ideas! Where did you buy the colored vampire teeth? Hi Mallory! I found those at Target last year. I saw them again this year in the seasonal section. You can get a mesh bag of them for around $3. Hope that helps! 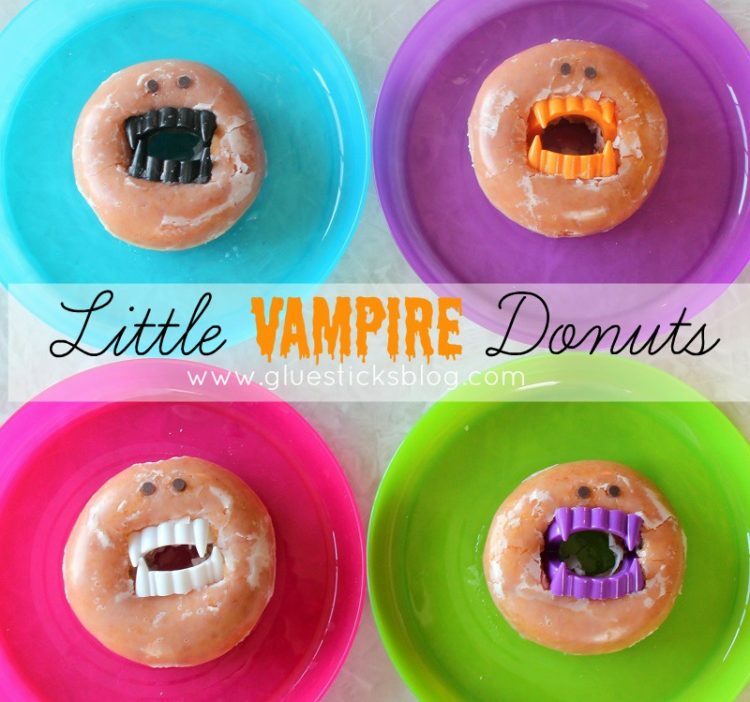 These are just the cutest little Vampire Donuts ever! Thanks so much for sharing with us at Full Plate Thursday and have a great weekend! Hahaha, oh my goodness! What a simple but perfect idea for Halloween parties! This is a SUPER fun treat for Halloween parties, my kids are going to love them. Thanks for joining this weeks Tasty Tuesday, I can’t wait to see what you share next week! Oh my when I saw these they made me laugh. They would be such a hit at a Halloween party! We love donuts and this would me so fun and easy to make. Thanks for sharing on Merry Monday. Pinned and will be featuring this in a Halloween treat round-up. This is really a fun idea. Thanks for sharing.